The prevalence of carpal tunnel symptoms may be understated in most literature. Even though researchers categorize carpal tunnel syndrome as the most common peripheral neuropathy affecting 3% of adults1, many cases of paresthesias do not meet the clinical criteria. In one study, 30% of frequent computer users complained of hand paresthesias, 10% met clinical criteria, and only 3.5% had abnormal nerve conduction.2 Whether technically categorized as carpal tunnel syndrome or not, research based occupational therapy, such as that available at Combined Therapy Specialties, can provide positive, low-risk, long-lasting results. The British Medical Journal published a study wherein 74% of patients treated with ultrasound therapy reported satisfactory improvement or complete remission of carpal tunnel syndrome at six-month follow-ups.3 This compared favorably to the 20% reporting success from the sham treatment group. In the active treatment group, improvements were also noted in motor distal latency and velocity of sensory nerve conduction, and these measures remained unchanged in the sham group. Ultrasound was administered daily for 10 days and then twice-weekly for five weeks. An older study, which failed to show positive results, ended the ultrasound therapy in two weeks.4 This may indicate that the length of ultrasound therapy is important for success. A review of 21 trials involving 884 people concluded that a hand brace significantly improved symptoms and function after four weeks.5 Splinting has also been shown effective when applied within three months of the onset of symptoms.6 Combined Therapy Specialties can create custom-made braces and/or select and fit splints for your patients. The Journal of the American Medical Association published a study showing the positive of effects exercises and stretches that emphasized function of the spine and shoulder, stretching the wrists, and posture correction.7 The movements used in this study were drawn from yoga. Among 42 participants, the active rehabilitation appeared even more effective than splinting alone in terms of improving grip strength, reducing pain, and improvement in Phalen sign. Another study showed positive results from digital flexor tendon mobilizing exercises.8 Patients performing these exercises opted for surgery 39% less often. When you refer to Combined Therapy Specialties, each patient receives an individual evaluation. According to each patient’s presentation, therapists may select exercises to improve bone-muscle-tendon alignment, reduce inflammation, improve flexibility, and facilitate relevant posture improvement. When approached correctly, exercises for carpal tunnel syndrome do have justification in the research. 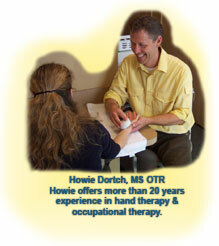 Combined Therapy Specialties makes ergonomic teaching a part of all carpal tunnel treatment plans. Simple measures such as increasing the size of a grip on equipment, rotating tasks to create breaks for the wrists, and changing the height of equipment to improve arm and wrist position may reduce severity and exacerbations. Combined Therapy Specialties can serve as a useful ally to your practice in the conservative treatment of carpal tunnel syndrome. Each treatment plan can include a combination of bracing/splinting, ultrasound, exercises, stretching, carpal bone mobilization, and ergonomic teaching. The Combined approach will help ensure positive outcomes and a satisfied patient. Atroshi I, Gummesson C, Johnsson R, et al. Prevalence of carpal tunnel syndrome in a general population. JAMA 1999; 282: 153-8. Stevens JC, Witt JC, Smith BE, et al. The frequency of carpal tunnel syndrome in computer users at a medical facility. Neurology 2001; 56: 1568-70. Ebenbichler GR, et al. Ultrasound treatment for treating the carpal tunnel syndrome: randomized “sham” controlled trial. BMJ March 7, 1998; 316: 731-5. Guly PJ. Carpal tunnel syndrome. BMJ 1959; i: 1184. Piehl J. Which nonsurgical treatments for carpal tunnel syndrome are beneficial? Am Fam Phys Aug 15, 2003; Vol. 68, No 4. Kruger VL, et al. Carpal tunnel syndrome: objective measures and splint use. Arch Phys Med Rehabil 1991;72:517-20. Garfinkel MS, Singhal A, Katz W, et al. Yoga-Based Intervention for Carpal Tunnel Syndrome. JAMA 1998; 280: 1601-1603. Rozmaryn LM, Dovelle S, Rothman ER, et al. Never and tendons gliding exercises and the conservative management of carpal tunnel syndrome. J Hand Ther 1998; 11: 171-9. Viera A. Management of Carpal Tunnel Syndrome. Am Fam Phys July 15, 2003; Vol 68, No2.